Eva Lechner is something of an enigma: Before yesterday, she only landed once on a World Cup Podium, which was last year during a ride to third at Rome behind Marianne Vos and Katie Compton. 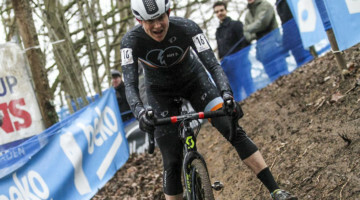 On the other hand, she is an avid participant on the World Cup scene, and dating back to the end of 2009, she only placed outside the top ten in a World Cup once, which was in 2012 during the Zolder stage. Sunday, she not only added a World Cup podium to her lone home-country finish, but took an impressive overall win after an early attack. Hoogerheide is clearly a course she enjoyes. Last year, during the 2014 World Championship Race, she took home the silver medal at the same venue behind Vos. 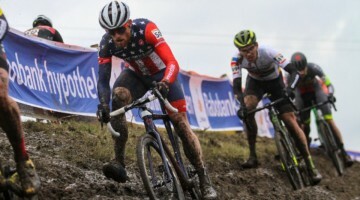 You can watch her finish at Hoogerheide in the video above, posted by the UCI channel. Like the Elite Men, U23 Men, and Junior Men, the Elite Women’s race in Hoogerheide saw rewards given to early breaks. With National Champions Marriane Vos, Katie Compton, Katerina Nash, and Pauline Ferrand-Prevot all converging on Tabor, Lechner has more then proven that she will be a major presence at the front.